"A quirky game where you must watch as many naughty videos as possible without getting caught!" NSFW: Not a Simulator For Work alpha demo is a quirky simulator game where upon starting a new job in a company you must try to waste as much time as possible by looking at certain rather naughty websites whilst not being caught by your colleagues so you must use your ears to listen out for any footsteps or the squeak of the mail guys trolley and make sure you click back on to your work page before you get caught watching explicit websites! The game sadly is very short although it is just the demo but there is a lot of fun to be had here, the more days you survive watching your jazz movies without being caught the more points you earn which in the full version it looks as if you will be able to use these points to spend on unlocking more different websites to waste your time on. The game has a nice pixel art style that looks very appealing and in the few minutes of game play that you do get in the NSFW: Not a Simulator For Work alpha demo there is a lot to be enjoyed here. 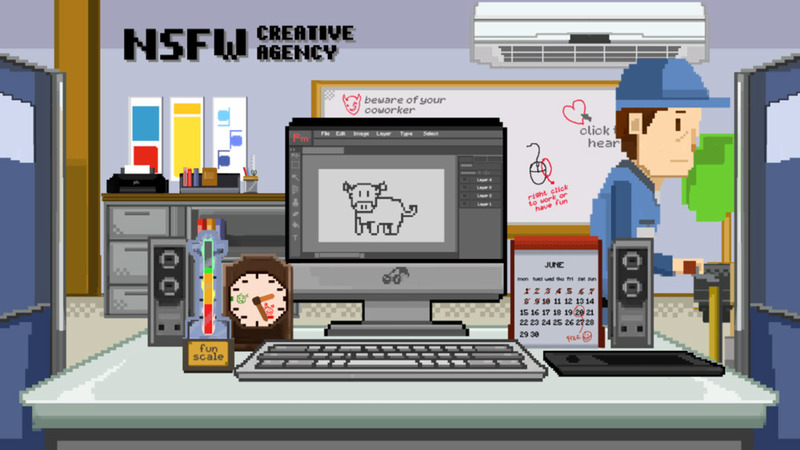 You can download the NSFW: Not a Simulator For Work alpha demo for free here.